When it comes to calming a kitty’s nerves, it can be difficult to find the right product. A cat (especially an anxious one) can become even more agitated if you force the wrong product on her. 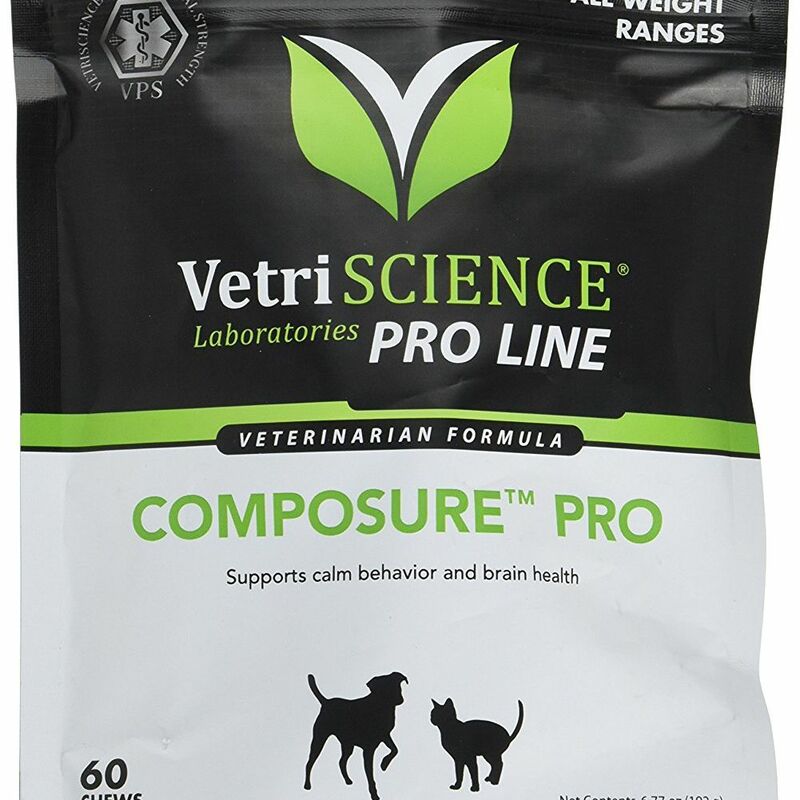 The VetriScience Composure Pro Bite-Size Chews are formulated for cats and dogs and feature an enticing chicken liver flavor that felines will love. They offer behavioral, cognitive, and brain support and can help reduce anxiety in nervous pets. Each chew contains Vitamin B1, L-Tryptophan, Colostrum Calming Complex, and L-Theanine. You can feed this relaxant either on an as-needed basis or daily for ongoing support. It’s proven to help treat hyperactivity, anxiety, and stress, especially when given daily. Your cat will see VetriScience as a treat, so you won’t have to fight her to eat it. Owners say it helps with long car rides and lonely days at home. If you want a product that’s well-rounded, affordable, and works for most pets, give VetriScience a try. If you want to safeguard specific problem areas within your home where you’ve noticed your cat marking territory or want a travel-friendly calming aid you can bring in the car, a spray might be your best bet. Pet MasterMind Cool Kitty Cat Calming Pheromone Spray uses an all-natural formula, with a blend of herbs and simulated pheromones designed to reduce anxiety and put a damper on your cat’s behavioral issues. The product is guaranteed by the manufacturer, and won’t harm your home’s surfaces upon contact. Amazon customers write that their anxious cats have become considerably calmer after they’ve used Cool Kitty spray, even seeing a decline in unwanted behaviors like peeing or biting other cats. Several people note that the effect can be almost instantaneous—simply give the area a spritz when you see your cat begin to mark or scratch, and they’ll likely stop the moment they detect the pheromone. Looking for an on-the-go solution you can grab on the way to your next vet appointment? Try a calming wipe, like these Feliway wipes from CEVA Animal Health. Containing pheromone analogue, they’re designed to quickly alleviate stressful situations and leave your cat feeling calm and relaxed. Each pack contains 12 wipes—try wiping them inside your cat’s carrier to give them the sense that it’s a comforting place, not a punishment for them to endure. Customers write that these wipes make trips to the vet far less stressful than they were before, and are especially helpful for cat owners who routinely make multiple vet trips per week. Some have even brought the wipes onboard long-haul flights, writing that their cat remained calm and quiet for the duration of their travel thanks to a few quick uses of these CEVA wipes. Having multiple cats in the house can cause problems, especially if you’ve recently introduced a new feline to the mix. The ThunderEase Multicat Calming Pheromone Diffuser is a plug-in diffuser that mimics nursing pheromones to help ease aggression, scratching, spraying and more. Each diffuser releases an odor-free vapor that can cover 700 square feet and lasts for up to 30 days. The best part? ThunderEase guarantees it will work for your cat or you’ll get your money back. Online reviewers say that ThuderEase works when other products don’t. One user said it helped ease aggression between four anxious cats while another remarked that it was great for a rescue cat who was struggling to transition. ThunderEase is a great at-home product that can help with new-pet introductions and multiple-cat households. If you want a safe, effective, and continuous calming aid, the Sentry Calming Collar for Cats may be a great choice for you. This collar uses pheromones and is infused with lavender and chamomile essential oils to help reduce stress and anxiety no matter where your cat is (perfect for those hectic vet visits or car rides). This collar fits small and medium cats and starts working in as little as two weeks after it’s been put on. Each one lasts 30 days, and you can buy either a single pack or a three pack. Cat owners say the Sentry Calming Collar works for stress-induced behavior such as chewing, clawing, and spraying. Some owners note that because it’s not a breakaway collar it can be dangerous for active cats, but many have crafted a solution to make it work for their pet. When it comes to calming drops, Bach Rescue Remedy is one of the most recognized brands on the market. This all-natural solution is made from rock rose, impatiens, clematis, star of Bethlehem, and cherry plum, and works for anxious animals of any kind. The drops can be placed directly into your pet’s water or on his or her ear, nose, or paw. It’s not a sedative, so it won’t make your cat sleepy or drowsy but rather calms his or her nerves during stressful situations. The dosage is not set so you can safely figure out what works for your cat. Bach Rescue Remedy fans say the product calms nerves and makes stressful situations more bearable. Owners love that it’s all-natural and completely safe for all types of pets and all situations. Sometimes the best way to get your cat to chill out is to trick them into doing so—like with a calming chew that takes the form of a treat. GNC’s chews are full of savory chicken flavor cats love and contain the amino acid L-theanine to encourage your pet to relax. Simply provide one soft chew when your cat is stressed out, or up to three if they’re experiencing more severe anxiety or aggression. The chews can be purchased in 21 or 60-count bags, and also contain thiamine (Vitamin B-1) and colostrum, a form of milk that supports cognitive function and stress reduction. Customers say GNC’s calming chews really help, have gone a long way toward resolving issues with anxiety and territorial behavior. While they have a slightly medicinal smell, most cats will eat them without any issue. If you’re considering using a nutritional supplement to help manage your cat’s stress, the first thing you’ll want to do is talk to your vet. With their blessing, a supplement can be a smart way to mitigate potentially hair-raising situations, like vet trips or thunderstorms. Vetoquinol Zylkene Behavior Support Capsules can be given from your hand or mixed with a meal as needed and contains alpha-casozepine, an ingredient found in cow’s milk, to naturally calm your pet without causing drowsiness. Don’t worry—it’s lactose-free, so your stomach-sensitive cat can safely consume it. These supplements are available in 14 and 30-count bottles and can be a helpful, all-natural alternative to heavier medications. Customers write that they’ve proven successful where other treatments have failed, so give these a shot if you haven’t had success with a diffuser or pheromone collar. The calming effects should quickly become noticeable. Our writers spent 4 hours researching the most popular calming aids for cats on the market. Before making their final recommendations, they considered 20 different calming aids overall, screened options from 13 different brands and manufacturers and read over 50 user reviews (both positive and negative). All of this research adds up to recommendations you can trust. Should Your Cat Get the FIV Vaccine?